At the corner of Mill Road - At the Pfinz, where once the mill race flowed back into the Pfinz, was until June 1930 the old mills of the village. Over time these grains were connected to both an oil mill and Nadelschleif- and a sawmill. At times, we operate on the premises and a plaster stamp mill. By 1900 it has been used as drive for a threshing machine and power generation. 1927 modernized the former operator, Gustav Siegrist, the plant with turbines and called the work "Pfinzmühle". The new happiness lasted only a short time, three years later the building was completely gutted. 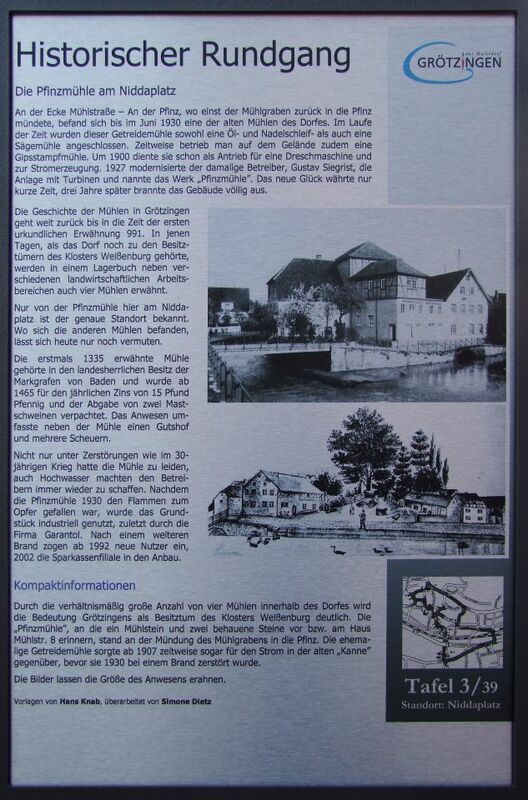 The history of mills in Grötzingen goes far back to the time of the first written mention 991 In those days, when the village belonged to the possessions of the monastery of Weissenburg, four mills are mentioned in a stock book in addition to various agricultural work areas. Only from Pfinzmühle here at Nidda place is known of the exact location. Where were the other mills, it can now only guess. The first mill was mentioned in 1335 in the sovereign possession of the Margrave of Baden and was leased from 1465 for the annual interest rate of 15 pounds penny and the release of two pigs. The property included a farm next to the mill and several chafing. Not only destruction as in the 30-year war had to suffer the mill, also made ? ?the flood operators constantly create. After the Pfinzmühle had fallen victim to the flames in 1930, the property was used for industrial purposes, most recently by the company Garantol. After another fire in 1992 attracted new users a, 2002, the Savings Bank branch in cultivation.